Pennsylvania's Supreme Court on Wednesday signaled it was unlikely to reinstate a controversial law that gave the National Rifle Association the right to challenge municipal gun ordinances across the state. During arguments that focused less on the merits of the 2014 measure than the legality of the process that made it a law, some justices had tough questions for an attorney for the Republican legislative leaders who helped enact the bill. "If, by brute force, the majority of the General Assembly can cram through any number of regulations ...," Justice David N. Wecht said, "the constitution takes a backseat." The law, known as Act 192, gave groups such as the NRA the right to challenge local gun-control ordinances, instead of limiting those rights to individuals. It was passed not as stand-alone legislation, but tacked on as an amendment to a bill that increased criminal penalties for stealing secondary metals, such as copper wire. Wary of protracted and costly legal battles with the gun-rights lobby, some towns and boroughs began repealing ordinances, such as ones that banned unlicensed weapons or required gun owners to report lost firearms. Other municipalities, including Philadelphia, faced lawsuits. Last year, Commonwealth Court overturned the law, siding with Democratic legislators who contended it was illegally and belatedly attached to the unrelated criminal penalties bill. Republicans appealed to the Supreme Court, which led Wednesday's arguments in the panel's City Hall courtroom. Six justices - five Democrats and one Republican - heard the arguments. Justice J. Michael Eakin is suspended. Justice Debra McCloskey Todd noted that lawmakers at first did take the traditional route in introducing the legislation, but that led nowhere. "This bill that we're talking about today actually died in committee, right?" she asked. Wecht peppered the lawyers with questions, including asking what such lawsuits "have to do with stealing cooper wire." Representing Republican lawmakers, Nicholas Orloff argued that part of the bill was related to the state's crime code, because municipalities that pass gun ordinances stricter than the state's are violating state law. "This was not a deceptive bill," he told the court. Martin Black, an attorney for Democratic lawmakers, told the panel that attaching the measure to another bill at the end of a legislative session prevented citizens from weighing in. Justice Max Baer added that municipalities also could have provided more input on the law if it had not been attached to another bill at the last minute. The court offered no clues as to when it would rule on the matter. 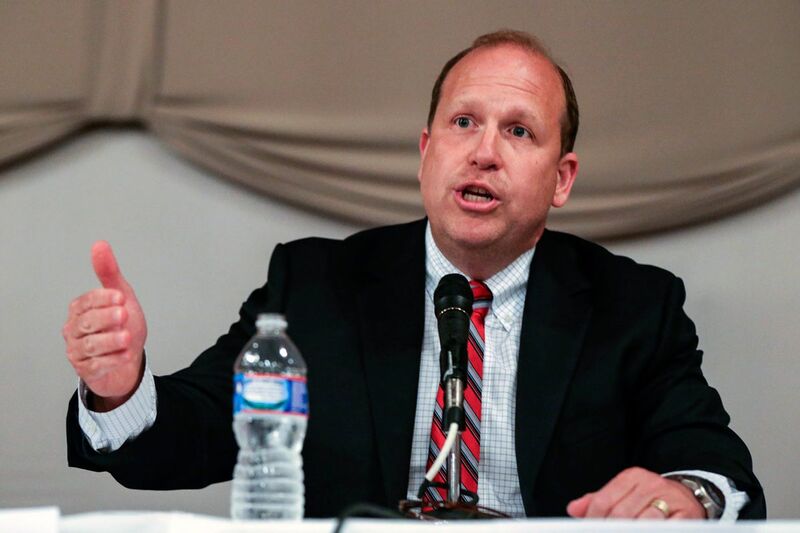 But after the hearing, Sen. Daylin Leach (D., Montgomery), an opponent of the law, said he was encouraged by the questions and reactions from the bench. "The justices got it, completely," Leach said. Jonathan Goldstein, an attorney representing the NRA, said he would keep fighting for gun owners if the justices do not reinstate the law. "We have over 200,000 members in Pennsylvania. We're not going away," he said. Still unresolved - at least until the high court rules - are lawsuits the NRA and guns rights groups had filed under Act 192 against Philadelphia, Lower Merion Township, Pittsburgh, Harrisburg, and Lancaster. Beyond expanding the pool of potential plaintiffs to include any organization with members who might be affected, Act 192 required municipalities to pay attorney fees and court costs if they lost such a lawsuit. "The penalties that were put into that statute were draconian penalties that no solicitor would want to subject a municipality to," said Joseph Bagley, the solicitor who advised Cheltenham Township to repeal its gun regulations after the 2014 law passed. Even after Commonwealth Court struck down the law, Bagley said, he advised Cheltenham not to reenact regulations until the Supreme Court heard the case. "It seemed to make a lot of sense to repeal and wait," he said Wednesday, "and that's exactly what we're doing."